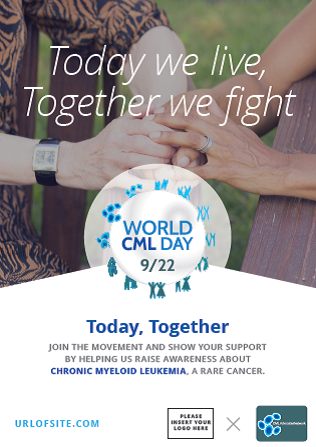 ... was the motto of the 2015 World CML Day campaign! One day, one community, one life changing reality… Today, we are together to make a status, share and involve on our needs. 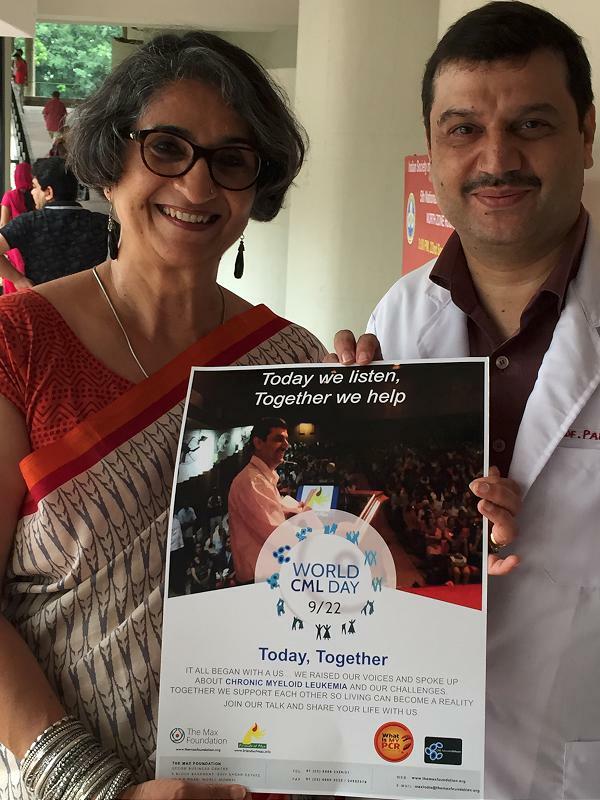 On World CML Day 9/22 2015 leukemia patients worldwide united to address the courage and hope required to live with chronic myeloid leukemia, and called for access to best available treatment and care for all patients. Pictures of the worldwide World CML Day 2015 events can be found here. Besides the many events reported from CML-groups from all over the world, on the occasion of World CML Day 2015 the CML Advocates Network launched its brand-new mobile CML ADHERENCE APP “ CML Today” for CML patients to support adherence to TKIs as well as to track their PCR results. The mobile app is available for free in English, French, Spanish, German, Portuguese, Arabic, Hebrew, and more languages will follow soon. „CML Today“ can be found in the Apple App Store (iphone) and in the Google PlayStore (Android). We had prepared a set of tools and resources to support our member organizations and other interested parties in spreading the message of awareness and to strengthen their voice. All posters and flyers were provided as InDesign, PDF and easy-to-edit PowerPoint files. Members were requested to translate the posters and flyers to their local language, include their organization´s logo and contact details, and inform about the World CML Day events taking place in their country. The database included photos for different cultural backgrounds, allowing our members adapt the posters & flyers to their reality. Besides the photos used in the poster and flyer templates (classified as “general”) African-specific, Asian-specific and Ibero-American-specific photos were made available. Members were also encouraged to insert their own pictures! The photos in the photo-database would serve as a source of inspiration! 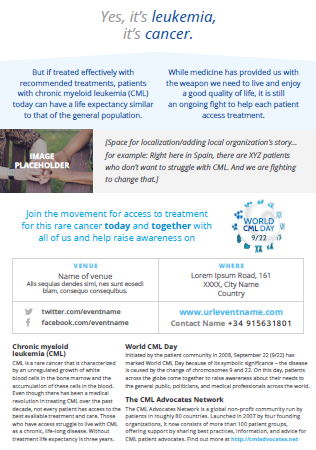 The CML Advocates Network provided an easy to customize press release and asked its members to feel free to translate the press release to their local language, add their own logo and quotes, and inform about the World CML Day events taking place in their country. The communication guidelines put at the disposal of our members contained valuable strategies and hints for how to get the most out of the World CML Day campaign. The full WORLD CML DAY TOOLKIT TRAINING is available for download here! In the section "Member´s campaign materials" you will find a compilation of examples of posters, flyers, press releases and other campaign material in multiple languages. These materials were provided by members of the CML Advocates Network that have joined the "Today, Together" campaign to promote our World CML Day! It´s a great source of inspiration - so don´t miss to have a look! A BIG THANK YOU to all active members and to all our supporters for spreading the message of awareness, for helping us strengthen our voice, and for helping us advocate for CML patients around the globe!